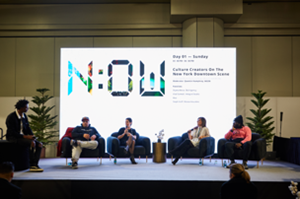 /EIN News/ -- NEW YORK, Feb. 01, 2019 (GLOBE NEWSWIRE) -- N:OW, the exploratory platform for discovery in menswear will open its West Coast edition at PROJECT Las Vegas after wrapping an informative session at PROJECT New York at Men’s Market. On February 5th, N:OW will showcase the best in culturally relevant men’s trend and ready to wear from brands including Alpha Industries, Champion, Candor, Fairplay, Pink Dolphin, Rothco and Publish. Alongside exhibiting brands in the space, N:OW Forums will feature highly anticipated panels and keynotes curated by WGSN with expert industry voices from Highsnobiety, The Real Real and Grailed. Iconic Harlem rapper A$AP Ferg will perform for the Official PROJECT After-Party at Light Nightclub on February 6th, sponsored by Champion to celebrate this season of the Las Vegas market. Last month in New York, menswear industry leaders and experts converged over three days. The neighborhood featured streetwear and contemporary brands such as Atomic Mission Gear, éS, Huffer, Brixton and aforementioned brands Champion and Candor. Panelist included editors from GQ, Highsnobiety and representatives from brands such as Rowing Blazers, and Moose Knuckles as well as leading trend forecaster WGSN and menswear anthropologist Mordechai Rubenstein aka @MisterMort. Topics for N:OW in Las Vegas include retail trends for FW’19, the new luxury, takeaways for resale and vintage markets and a retrospective on youth culture. About N:OW at PROJECT | An immersive 360 experience hosted by culturally relevant brands that drive fashion forward, while remaining commercially viable. N:OW features panels, entertainment, food/beverage, daily happenings, brand installations and exclusive events. About PROJECT | Held bi-annually in New York and Las Vegas, PROJECT is the world’s preeminent contemporary fashion trade event, encompassing men’s, women’s, accessories and footwear brands within PROJECT Vegas, PROJECT Women’s, THE TENTS, PROJECT New York and PROJECT SOLE New York. Bringing expertise and relevance to the global fashion industry through a highly merchandised approach, PROJECT creates destinations where innovation, commerce and service converge. For more information, please visit www.projectshow.com. About Informa |Informa PLC is a leading, international business to business information services Group, operating in over 30 countries. We create transaction-led exhibitions and content-based events, specialist data, intelligence and marketing services products, as well as scholarly research and specialist reference-led academic content. Our products and services help businesses and professionals connect, learn, do business and gain an edge over the competition. Informa is listed on the London Stock Exchange and is a member of the FTSE 100.